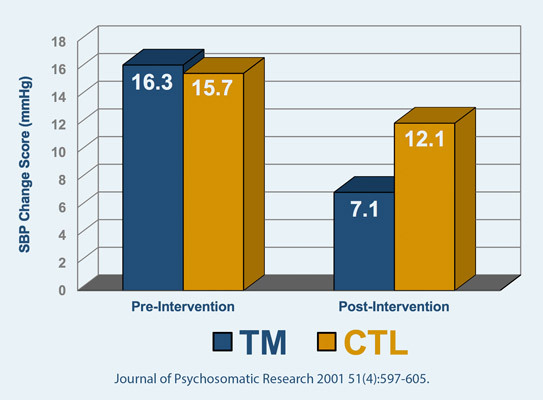 The Transcendental Meditation® (TM) technique is an effective therapy for healing the stress-related conditions of wounded warriors; it is also a powerful technique for promoting peak performance. Many highly successful people from all walks of life—business, sports, the arts—practice TM® for the benefits it brings to their professional and personal lives. Stephen Covey, author of the acclaimed Seven Habits of Highly Effective People, identified “sharpening the saw”—self-renewal—as the most fundamental habit. This habit keeps individuals fresh so they can continue to practice the other six habits. Without this renewal, the body becomes weak, the mind mechanical, the emotions raw, and the spirit insensitive. Transcendental Meditation, as Stephen Covey himself said after he learned, is a highly effective way of sharpening the saw. TM works through quieting the amygdala—the fear center of the brain—and strengthening functioning of the prefrontal cortex—the CEO of the brain, responsible for planning, impulse control, and executive functions. During TM practice, there is reduced blood flow to the amygdala and increased blood flow to the prefrontal cortex. This supports the experience of restful alertness—the mind being quiet but alert at the same time. Restful alertness is an optimal state for learning and decision-making. This fMRI picture of the brain depicts decreased blood flow with the color blue and increased blood flow with the color red. The amygdala, located deep in the center of the brain, becomes quieter in TM. This signifies reduction of fear and agitation. The pre-frontal cortex receives more blood. This supports greater clarity and enhanced executive function. At the same time, TM increases brain wave coherence, or orderliness. During TM, a pattern of global brain coherence is created—neurons in all regions of the brain fire in synchrony. This coherence is particularly pronounced in the pre-frontal cortex. Longitudinal research has shown that brain wave coherence in the pre-frontal cortex increases outside of meditation in activity, with TM practice. 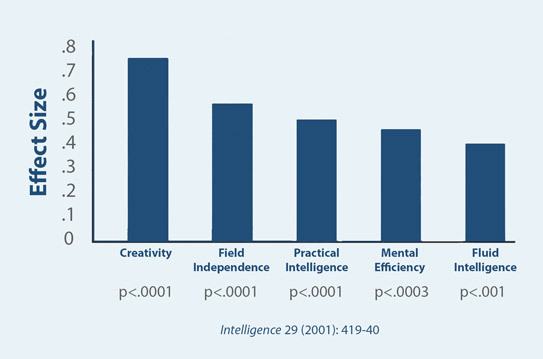 This is significant because research on brain coherence shows that it is positively correlated with intelligence, creativity, and moral reasoning. Resilience—the capacity to recover quickly from difficulties—is key to peak performance over time. Stress researchers say there is no such thing as a stressful situation; there is just a stressful response to a situation. How people respond to a situation is a function of the strength or resilience of their nervous systems. People who are more resilient are less stressed by the world around them. The Transcendental Meditation technique, through its effect on reducing stress and optimizing brain functioning, builds resilience to stress. 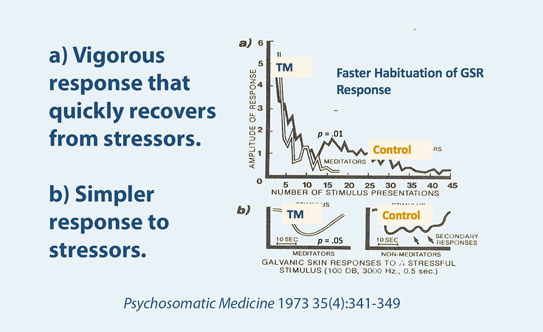 Research has shown that TM practitioners habituate more quickly to stressors and that they demonstrate fewer stressful responses to the same stressful situations over time. 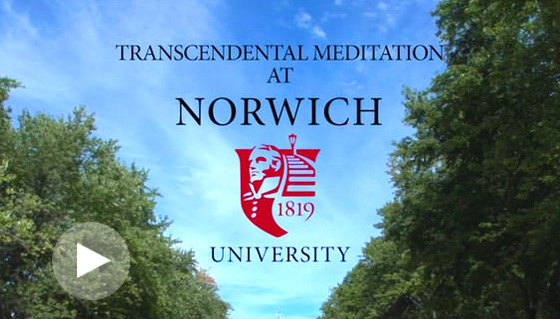 Norwich University conducted a test where it randomly assigned incoming “rooks” to a meditating platoon and a non-meditating platoon. President Richard Schneider, Rear Admiral USCGR (Ret. ), recalls that “within four or five weeks, the kids who didn’t get the training were complaining that the other kids had an advantage over them.” Within 90 days, the platoon that learned TM was outperforming the control platoon in every measurable functional area. These results were substantiated by psychological and neurophysiological tests conducted by the faculty at Norwich. The research found significant reductions in depression, anxiety, and stress in the TM platoon and significant increases in constructive thinking, behavioral coping and resilience. This study was replicated in the next year at Norwich and they found the same results.